We are battling the flies again. In some ways, I don’t think they’re as bad as they were last year – probably because of a late frost that killed off a bunch of our normal pests – but the ones that are deviling our horses are really bad. Last year, we had a three-pronged approach to fly control: Equispot on the horses, feed-through fly control in the horses, and fly parasites in the horses’ environment. This year, we just weren’t prepared. Between the weird weather (One day, “It’s spring!” Then, “Wait, it’s winter again.” A week later, “I think it’s summer already!” The next day, “Nope, winter again…”) and our traveling, the flies kind of got the jump on us. Our poor horses are really suffering. We are in fact using the fly parasites again this year, and I think they work really well. Unfortunately, without investing in a really big supply of them, we can only effectively treat the barn area. So the barn is virtually fly-free, but the pasture, where the horses spend most of their time, is still pretty fly-infested. That’s where the feed-through fly control would work. (Both the fly parasites and the feed-through fly control work by stopping fly larvae where they are laid – in the manure.) We like to get ours from a local feed store because it’s very economical, but haven’t had a chance to get over there (“local” for us means within 75 miles; this place is about 50 miles away). In the meantime, we’ve been using fly spray, which our horses hate and which doesn’t seem to work all that well anyway. We’ve also applied SWAT to their bellies again, which is very nasty and messy but does seem to help. Since the flies seem to bother their faces the most, we decided we’d give fly masks a try. We got just one yesterday to see if they would even consent to wear it. We bought a SuperMask II without ears. Since my horse is was a fancy show horse and therefore seems to be more open to weird things being done to him, we thought we’d try him first. We put him in the stall, got out the mask and brought it over to show him. He backed away like I was holding a snake! Not a good start. But after letting him sniff it all over and giving him lots of reassurance, he did actually let me put it on with no trouble. He wore it for a couple of hours out in the pasture and didn’t seem to care at all. One reason we didn’t try the mask last year is that we were concerned that it would affect their vision. 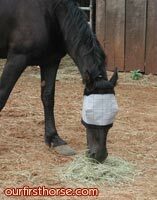 All the fly mask companies claim that their masks don’t obstruct vision, but since “keeping an eye on things” is so important to a horse, we didn’t want to impede their sight in any way. So we tested it on the way home to make sure you really can see through – Bill wore it while driving. 🙂 He says he could see just fine. So I don’t think there’s anything to worry about there. Isn’t he a devoted horse owner? On the down side…it sure looks goofy. On the horse, not Bill. Well, okay, on Bill too. It’s a hard look to pull off.